This a great way to to kick off a little Mexican Fiesta or BBQ. Easy to pull together, will feed a crowd and tastes as good as it looks. As with most of my Mexican flavours this comes courtesy of the wonderful Rick Bayless, though I did get Thomasina Miers Mexican Food Made Simple recently so some new Mexican inspiration to come soon. 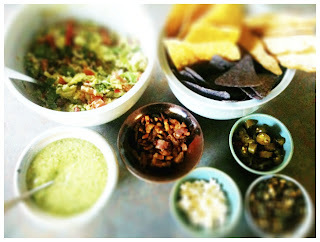 This one is especially good for a crowd with all the trimmings which make things a little more interesting than just a bowl of guacamole and tortilla chips, not that there is anything wrong with that. Rick's new book Fiesta at Rick's has several guacamoles: including bacon and tomato, grilled garlic and orange, roasted garlic and this Yucatecan one. The roasted garlic one is delicious and has been making regular appearances and is a great one for those that don't like chilli. Makes 4 cups, serves 12 as part of a fiesta! 2 tbsp fresh lime juice, plus a little more if necessary. In a small dry skillet over medium heat, roast the unpeeled garlic until it is soft and blackened in spots, 10 - 15 minutes. Cool then peel and finely chop. 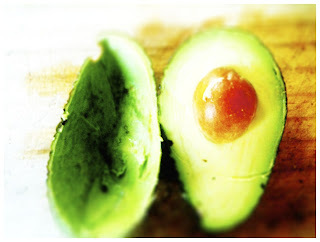 Cut around each avocado from stem to blossom end and back again, then twist the halves apart. Dislodge the pit and scoop the avocado flesh into a large bowl. Add the garlic, coriander and lime juice. Coarsely mash everything together. Taste and season with salt, usually about 1 teaspoon. 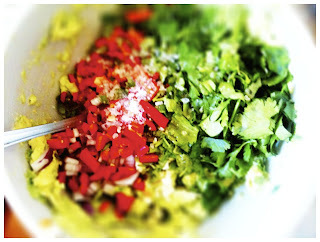 Scoop in to a serving bowl and cover with plastic wrap directly on the surface of the guacamole. Refrigerate until you are read to serve. This one is also great with all the trimmings. 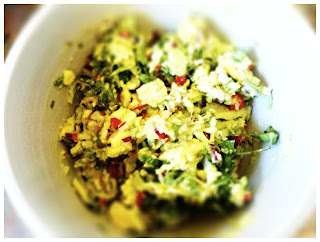 But last weekend I felt the need for a change and a little chilli, so I decided on the Yucatecan guacamole. 1/2 cup (loosely packed) coriander, chopped and thick bottom stems cut off, plus a few sprigs for garnish. 1-2 fresh habanero chillies, stemmed, seeded and finely chopped, plus an extra one for garnish. I used regular red chilli as habanero hard to find here in NZ. If you are lucky enough to find them please note they are fierce and fiery! 2 tbsp fresh sour orange (or lime) juice. I used lime as I love lime. 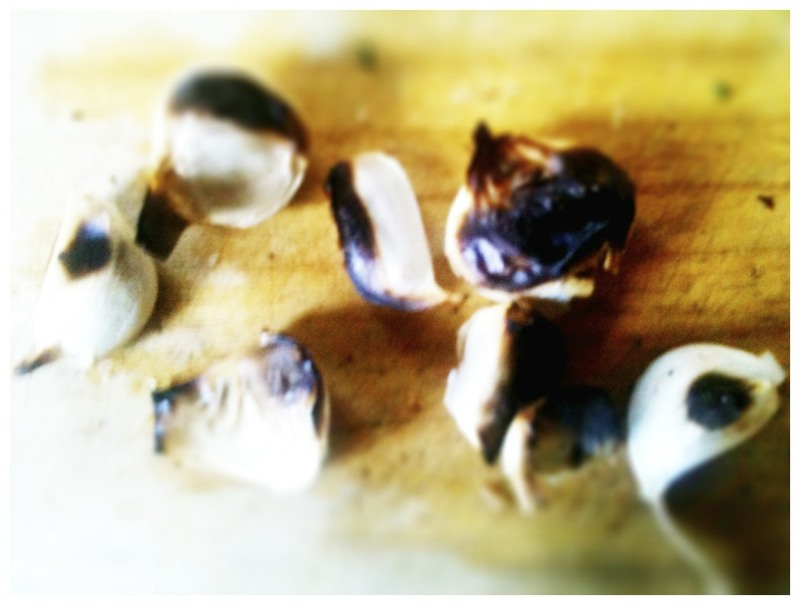 Cut around each avocado from stem to blossom end and back up again, then twist the 2 halves apart. Dislodge the pit, then scoop the avocado into a bowl. Scoop the onion in to a small strainer and rinse under cold water. 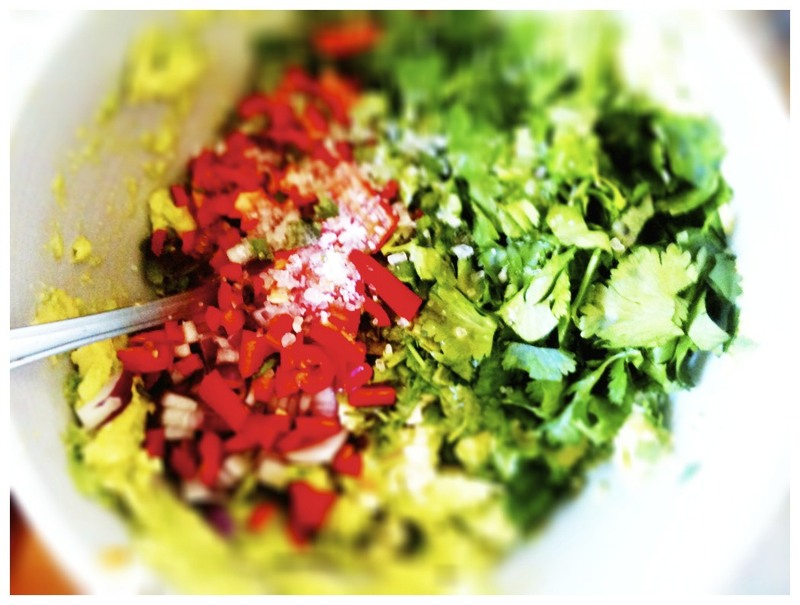 Shake off the excess and add to the avocado along with the tomato, garlic, coriander and chillies. Use a large fork or potato masher to work all the ingredients into a coarse mash. Season with the sour orange or lime juice and salt, usually about 1 teaspoon. If not using immediately cover with plastic wrap pressed directly on to the surface of the guacamole and refrigerate until you are ready to serve, which really shouldn't be for more than an hour or so. Scoop in to a serving bowl and sprinkle with a little coriander and chopped chillies. For the trimmings I used some diced bacon fried until crispy, pickled jalapenos, crumbled feta cheese and Pepita's. 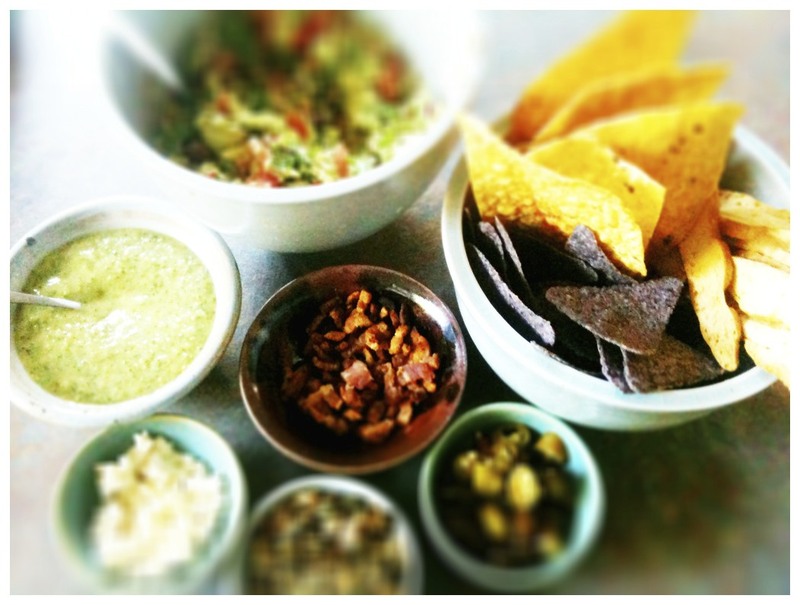 Scoop them all in to small serving bowls and serve with the guacamole along with some tortilla chips and crostini or pita chips. 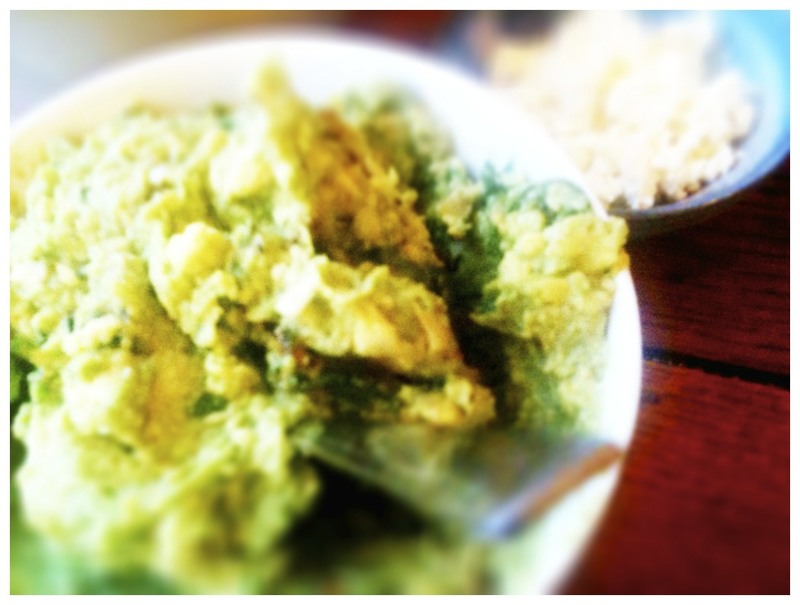 Scoop up the guacamole and top with your favourite trimmings. 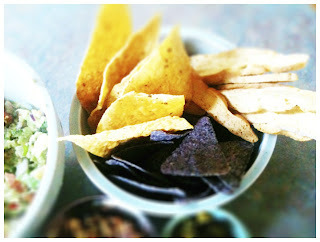 I also had some tomatillo salsa from Mexican Specialties. Delicious! This guacamole is full of bright flavours that all managed to sing out, the creaminess of the avocado, the freshness and crunchiness of the onions, the zesty lime and fragrant coriander all finished off with a little heat from the chilli. Perfect on a summer evening with an ice cold cerveza or a margarita, champagne margaritas are very good!